Ask fellow campers about "Pecan Valley RV Park" and nearby attractions. Very quit with big camp sights. No office but very nice camp host. No cell service but free Wi-Fi that works ok. Dish and air are good. Lots of deer am/pm walking around. We camped at Pecan Valley RV Park in a Travel Trailer. When we were directed to our site I thought I was being sent down a road, but the whole thing was our site! I've never seen larger pull through sites anywhere. There were large trees surrounding us that would provide excellent shade in the summer. There was also a river that would be very inviting in warmer weather. Deer came to the campground every evening for feeding. The clean and convenient bathrooms were heated with propane Gas Buddy's so they were very pleasant for taking showers. The camp hosts were very friendly and helpful. I would definitely return here. We camped at Pecan Valley RV Park in a Fifth Wheel. Great park, great staff we wil go back soon. We camped at Pecan Valley RV Park in a Motorhome. Amazing host were extremely attentive ...and the deer were all over the place truly magical. Access road is paved the entire way. Easy in and out. Stay more than one day, enjoy the deer as they are plentiful. We camped at Pecan Valley RV Park in a Travel Trailer. This place is a jewel! Shaded sites among a pecan grove, close to the North Llano River. Lots of deer wondering around. Very quiet, and only 3 miles out of town. Only stayed one night but will stay longer next time. We camped at Pecan Valley RV Park in a Fifth Wheel. Beautiful place with deer all around. Site included a picnic table and fire pit. Great place for viewing the stars! Well maintained park and safe. I would definitely recommend staying here. We camped at Pecan Valley RV Park in a Travel Trailer. Really nice and secluded RV Park. Lots of open grassy space. Site was a bit un-level front to back, levelers were able to level OK. Quiet with just a little road noise. No amenities except bath and showers. WiFi was OK for e-mail. Cell service weak. Stayed a wonderful 2 quiet nights. Would definitely come back again. We camped at Pecan Valley RV Park in a Motorhome. Lovely little park surround by large trees and space! Very friendly host and owners. Just stayed for one night but definitely stop there again. We camped at Pecan Valley RV Park in a Fifth Wheel. Convenient to Junction and shopping, fuel, etc. Experienced a truck breakdown on our trip out west....so we limped to the nearest RV Park and luckily it was the folks at Pecan Valley. They had a very large pull through spot for us. The site was level and clean...they even provided extra leveling boards (just in case). Not much in the way of amenities, but the river is close by. 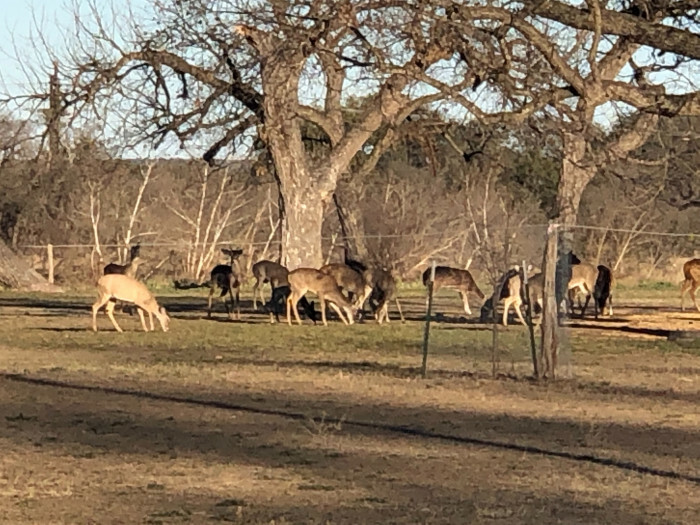 There is a large pecan orchard on the property and it makes for a nice evening walk with the many deer that visit. We camped at Pecan Valley RV Park in a Fifth Wheel. Stayed two nights. Easy access and egress as it is between freeway interchanges. Manager was very nice and helpful. Grounds very well kept. Sites gravel/level. Wi fi was weak at best. Could use Verizon extended network works fair for basic, no streaming. Deer running around in campground. Didn't use restrooms. We camped at Pecan Valley RV Park in a Fifth Wheel. This was a quick overnight on the way to Big Bend for me. I decided on it instead of the other parks in the area because I heard Verizon phone or Jetpack had no service at all in this area. Others said this park had decent wi-fi at the sites (you didn't have to go to office like at some of the other parks) and that was important to me. The wi-fi certainly wasn't zippy, but it worked well enough. No tv, either local channels or cable. My satellite dish worked well since my pull through site was pretty open, although there are nice pecan trees throughout the park. A small park, only 14 sites, with a few pull-throughs and some back-ins. The pull-throughs are massive and sites are gravel and level. Very nice space between sites. All FHU, with both 30 and 50 amp service. Picnic tables, fire rings at each site. I saw a bathhouse, but didn't check it out. It's about 3 miles from I-10, so no highway noise. Camp host was super nice and I would stay here again. We camped at Pecan Valley RV Park in a Motorhome. If you want a park with no tv, Internet this is an ok park. We thought price was high for what you get. We camped at Pecan Valley RV Park in a Travel Trailer. The camp host were on site and greeted us as we came down the drive. The sites were level and the hook ups were centrally located. There was no cable or wifi, just a good stop over place. We camped at Pecan Valley RV Park in a Fifth Wheel. Camp host was not there when we got there, but the owner noticed us parked there after about 5 minutes. She told us where to set up and said the host would get with us when he got back. The host and the owner were both polite and helpful. This is a small park, only 14 spaces with pull-throughs. Two had 50 amp service. Park was well cared for and was clean. They do not accept credit cards, so make sure you have cash. There is no pool or any other amenities, but there are deer that come into the park in the evening. We counted 20 of them feeding in the park. This is a good place to stay overnight when passing through on I-10. We camped at Pecan Valley RV Park in a Motorhome. Stayed here one night while passing thru the area. About 4 miles to the west of Junction just south of I-10. Must know the address since there are no signs. Mostly pull thru sites, some with 30 and some with 50 amps. 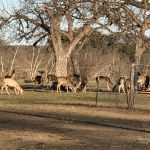 Very peaceful place between a pecan orchard and the N. Llano river. Deer are plentiful in the evenings. 50A and sewer were good, fair water pressure. Cell coverage with our AT&T hotspot was good. Unable to get any TV channels from our antennae. Only 14 spots but seems to usually have sites available. We will definitely stay there again when in the area. We camped at Pecan Valley RV Park in a Fifth Wheel. Are you affiliated with Pecan Valley RV Park ?